To keep our weekly menus from becoming boring or routine, we’re always keeping an eye out for good, new-to-us recipes, from a variety of sources. One surprising (to me anyway) place where we’ve found several great dishes is People Magazine. I’m sure someone out there will poke fun (you know who you are), but I’m not afraid to admit that I am a subscriber to People and have been for years. I’m not trying to say I subscribe to People just for the recipes (the magazine also features reliable reviews of books, music and shows, human interest stories, and of course, celebrity photos and gossip), but every couple of months I find a recipe there that looks interesting enough to tear out and save in our “to try” recipe folder. Given how much we love shrimp and how often we eat it, the magazine page with this recipe (by former Top Chef winner Hung Huynh) didn’t sit in the folder long before we tried it and loved it. We adapted it a bit by adjusting the seasonings and cooking time, but were quite pleased with the buttery (without actually using butter), fresh and slightly spicy end result that was super easy and quick to prepare. And speaking of easy, I’ll save you the trouble of composing your own joke by freely admitting that yes, I do happen to glean much of my knowledge of current events via E! News. You’re welcome. 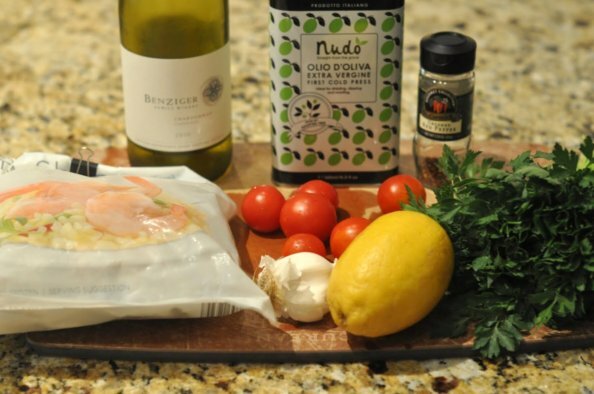 Prepare the sauce for the shrimp by whisking together olive oil, lemon juice, white wine, garlic, salt and red pepper flakes. The original recipe calls for a tablespoon of red pepper flakes for 2 pounds of shrimp. We reduced the amount of red pepper to 1/2 teaspoon (for 1 pound of shrimp) — we like spicy food, but still wanted to be able to actually taste the shrimp! Prepare the shrimp by peeling and de-veining it. We use large shrimp (“jumbo” or “colossal”) because it’s easier to flip less of them when they need to be turned half-way through cooking, but medium or small shrimp would also work in this recipe. Lay the shrimp in a single layer in a glass baking dish and pour the sauce over the shrimp, making sure the shrimp are all well-coated. While the shrimp bakes, chop up the tomatoes and parsley. Serve in a low bowl, with plenty of sauce spooned over the shrimp, and garnish with chopped parsley. Add some pasta and/or good crusty bread to make the meal a little more hearty. Enjoy while watching your favorite Real Housewives educational show on the History Channel. Whisk together olive oil, wine, lemon juice, garlic, red pepper flakes and salt. Lay shrimp in a single layer in a glass baking dish. Pour olive oil mixture over the shrimp until well-coated. Bake the shrimp in the oven until cooked through — about 10 minutes total. I’ve read this post every day for the last week trying to find out what anyone could possibly poke fun at. All I see are great tips for a good looking shrimp dish and a few references to the greatness of modern American culture—celebrity mags, celebrity cooks, and celebrity TV news. I don’t see anything funny at all. Yet somehow I still end up feeling mocked. But thanks for reading 🙂 Yup, that’s an emoticon. I, too get great recipes from People magazine, and have used this one with great success several times. Unfortunately, I lost the recipe and couldn’t duplicate the flavor using just my memory. Thank you for re- publishing and tweaking this. I had forgotten the olive oil, and it just didn’t come out right. Hi Kathy! So glad you found our post – we too love this shrimp recipe!